As my dog has gotten older (he’s technically a senior dog but with plenty of years ahead and spring left in his step, thank goodness), I’ve become acutely aware of his sensitive stomach. I’ve done my due diligence in changing his dog food to one that suits him perfectly, but after two bouts of sleepless nights and trips to the doggie ER for what was only a snack, I realized that even those little tiny pre-packaged treats might not do the trick for him anymore. Homemade treats are so easy to make that I already feel guilty for not having baked them years ago. My dog is one helluva trooper, I tell ya. He was a tick-infested sickly thing found wandering a mountain in Korea when he somehow made his way to us. He’s had surgeries on his back and mouth (and now proudly wears the nickname of My Little Jack-o-Lantern). And, of course, his sensitive stomach. Given that to work with, I willing to do everything in my power to keep him healthy and strong. Combine all ingredients in a food processor until a rough dough forms. It should stick together but not stick to your hands. Working in batches, roll out dough on a cutting board. No flouring of the board or rolling pin necessary with this recipe! 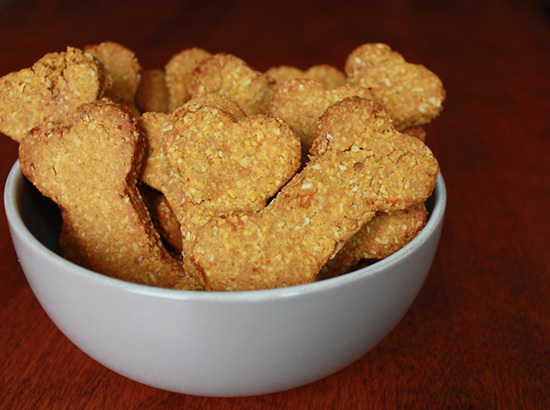 Use a bone-shaped cookie cutter and place biscuits on a parchment-lined baking sheet. Bake at 375F for a full 25-30 minutes until golden and crispy. Let cool before storing. The key is to ensure that all moisture is removed so that they can keep for a few weeks. 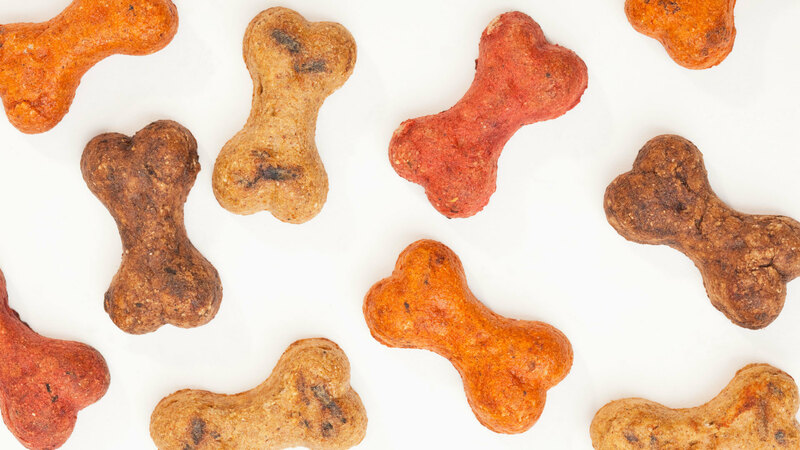 Trust me, with this recipe you’ll have one happy pup on your hands! And, not to be gross, but they are kinda tasty for humans too. Just make sure to call them “biscotti” and no one will know.